These Chicago kids hardly ever saw a hill before. Just back from a week in the Smoky Mountains, and it couldn’t have been more perfect. 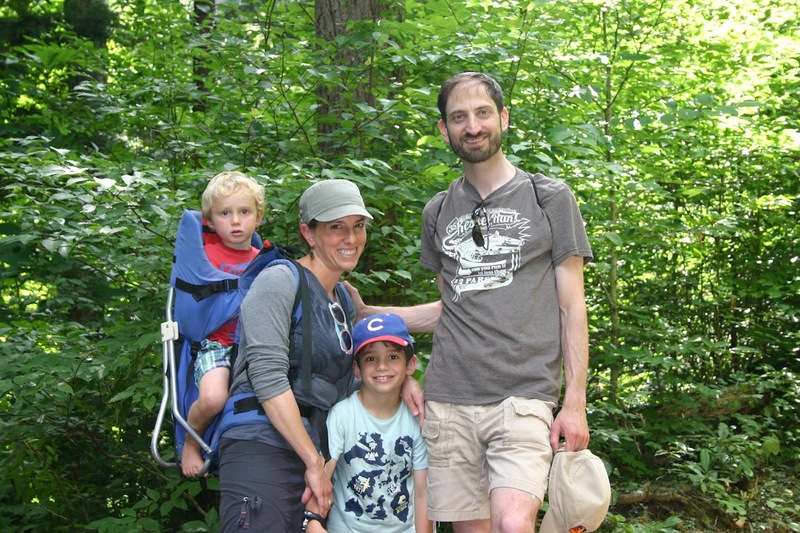 Our annual family camping trip is always a highlight, but our adventure last week was over the top. Recorded for posterity below is our day-by-day adventures, which you can read if you’re like my mom, who’s willing to listen to everything I have to say. If all you want is the Tennessee-inspired corn pancake recipe, you can just skip to the bottom. 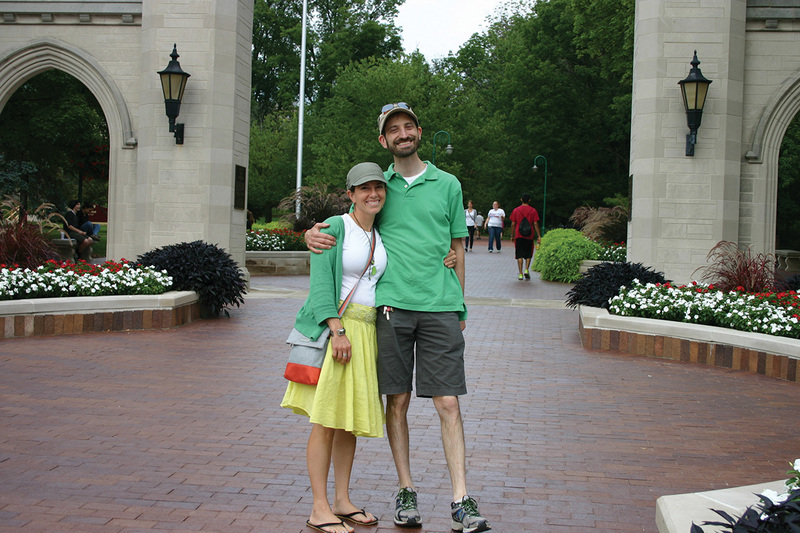 Bloomington Reunion: We kicked off our trip with Shabbos at the Indiana University Chabad house, where my husband and I met. It was our first trip back to Bloomington, and it was a thrill to show our kids all the places we lived, studied and played. We didn’t match intentionally, really. 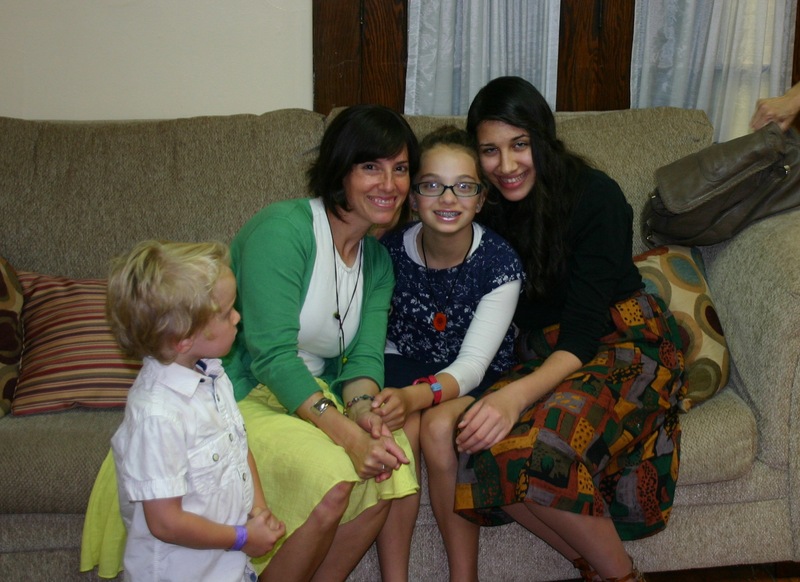 This gal on the right was only 7 last time we were in B-town. 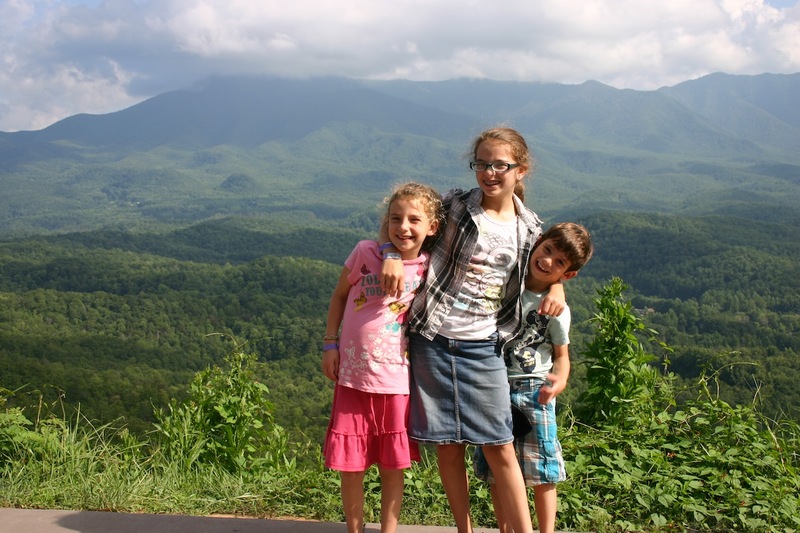 Smoky Mountain Sunday: It took 6 hours to arrive in Gatlinburg, Tennessee–most of which my children were screaming and whacking each other. We chose to blast This American Life and ignore them. 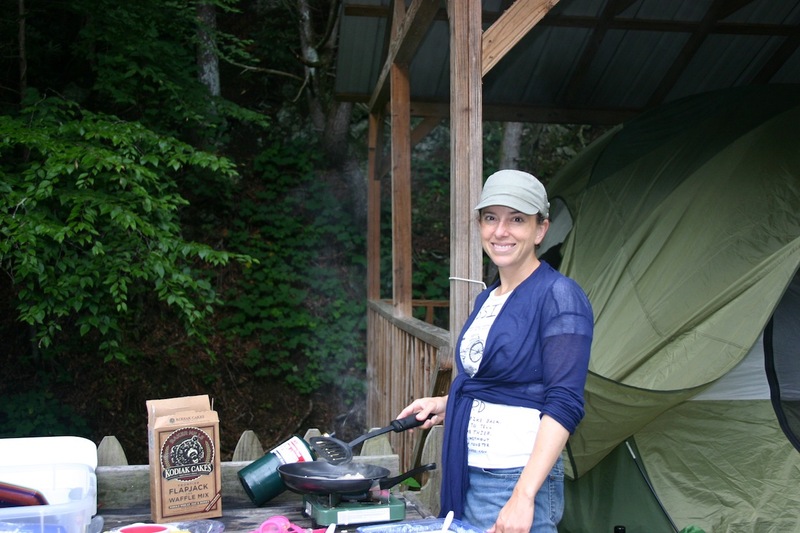 Upon arrival, we set up camp by a river and across from a trout pond–not too shabby! Trout were literally leaping out of the pond, otters swimming through it, frogs croaking and the rushing river sounded like one of those Bed, Bath & Beyond sound machines on full blast. 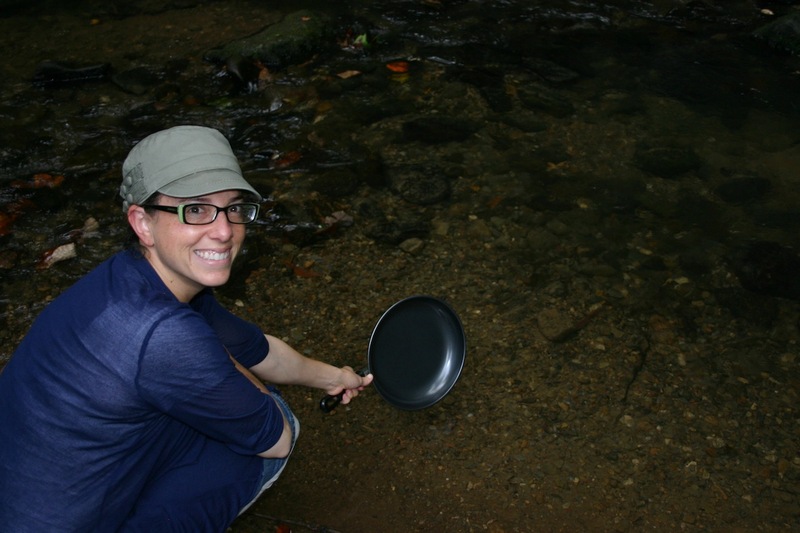 A river by the tent is a convenient way to toivel a pan. Monday: After a flapjack breakfast of champions, we headed out to meet our cousins and family, who also came for our Smoky Mountain adventure, for our first waterfall hike. This propane stove adds a whole new level of possibilities to camping food. 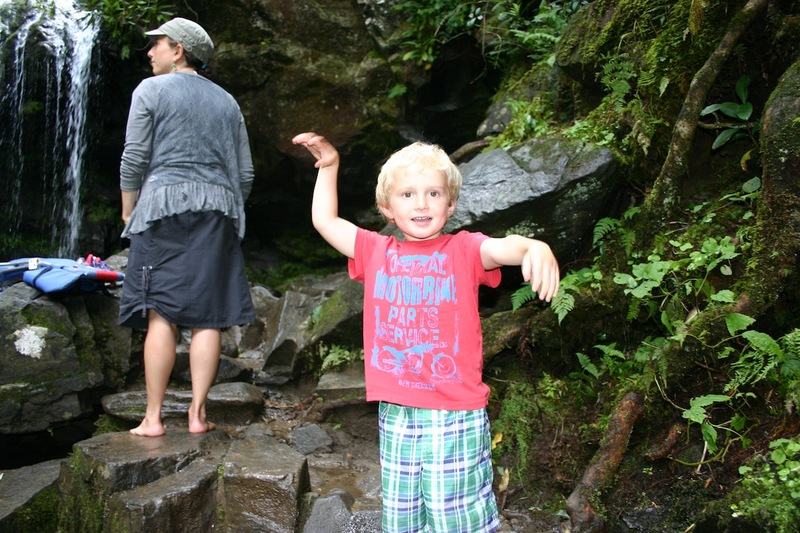 Laurel Falls was a perfect place to start, with it’s stunning views and stroller-friendly trail. Along the way, we bumped into friends from yeshiva, who agreed to be our Shabbos guests later in the week! We then headed back to our campsite to spend the afternoon flying down the mountain side on a water slide that was an awesome campground amenity. Next was dinner off the grill and roasted marshmallows (yes, we eat marshmallows full of sugar and fake ingredients on camping trips because sometimes you just have to live a little). White Water Rafting Tuesday: Rafting was pretty much everyone’s trip highlight. The two-hour trip down the rapids was thrilling and stunning. Later we brought our cousin back to sleep at our campsite for what we expected would be another relaxing evening. And it was, that is, after the bear encounter. 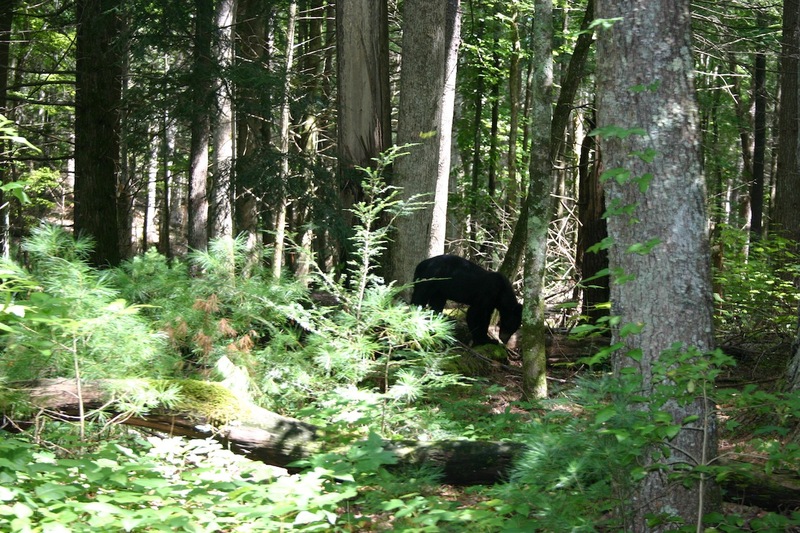 We had heard there are a lot of bears in the Smokies–1500, actually. However, once I saw that our campgrounds was not careful about using bear-proof garbage cans at the campsites, I relaxed thinking that they never get bears on the grounds. Silly me. I was standing at our site with our kids nearby, when my niece pointed to the left and said, “What’s that?” BEAR! was the next thing I heard, and then instead of remaining calm, I started screaming for them to get in the car as a 200 lb. black bear raced across the grounds toward the woods to our left. It took all of 30 seconds for us to start laughing hysterically and exclaiming how cool it was to see one so close. Wednesday Hike: We ditched our girls on Wednesday, who opted to head to a lake for boating with our cousins, and instead took our boys on another waterfall hike. This time, I had to carry Granola Baby–who, I might add, is officially now Granola Boy. If carrying a 30 lb. kid on your back up a mountain doesn’t make you realize how big he is getting, then I don’t know what will. But the view at the top of the Grotto Falls hike was worth every step. Needless to say, I did not need to run later. Happy dance once we made it to the top. And a snake for our way down. Ew. Thursday Tubing: 90 degree days meant more water fun on Thursday. We each rented a tube and went down the lazy river that was an actual river–as opposed to an indoor water park river. After rafting, the kids yawned through much of the ride, but we adults were thrilled. 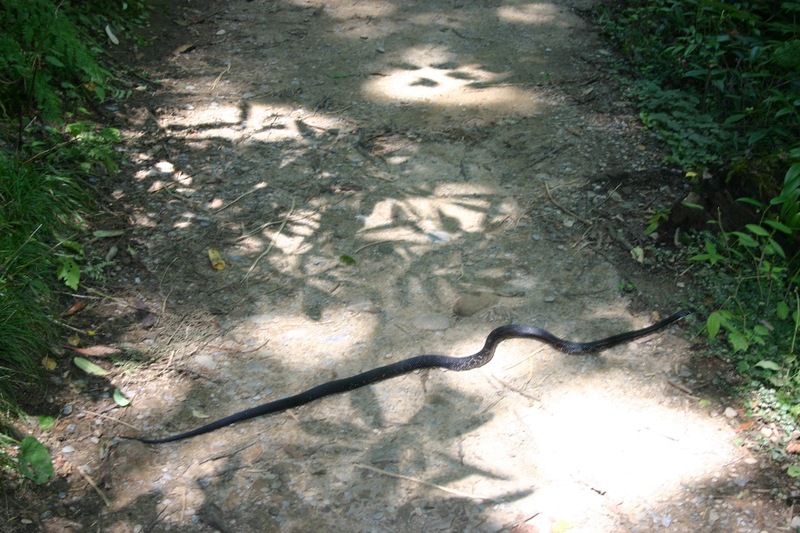 Friday in the Forest: We did what felt like the most all-American activity imaginable on Friday by driving in our behemoth vehicle through an 11-mile road in Cades Cove to view nature through our windows. We made stops at the first settlers’ cabins, a working mill (hence the corn pancakes recipe) and saw more bears (through the safety of our windows!). Shabbat Cabin: We moved into our family’s luxury cabin for Shabbat. You’d have to be the type to go camping to understand this, but Granola Boy best expressed how we all felt about moving back into civilization by crying hysterically that he wanted to go back to our campsite. 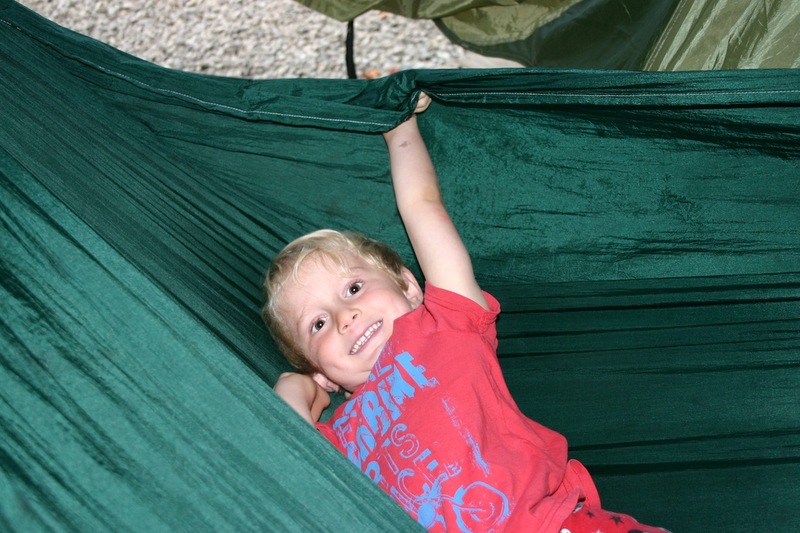 I want to chill in my hammock by my tent! A ranger on our trip said it best when he contrasted our living quarters to those of the original settlers: once upon a time people slept in a postage stamp-sized home and lived on hundreds of acres. Today we live in our McMansions and keep postage stamp-sized yards. That original way of life is pretty much the way it feels to go camping. Our postage stamp sleeping area. Shabbat Day: What I feared would be the longest, most boring Shabbat day ever turned out to be fabulous. We started the day with our cousins still around, who are pretty much our favorite people ever. Once they left, though, we had our Shabbat guests to look forward to. We were thrilled to re-meet in Gatlinburg, of all places, and doubly thrilled to have friends in walking distance in the middle of nowhere! Once they left, there was no time to get bored, as our next bear encounter was right around the corner. I went out on the balcony to see a 300 lb. bear lumbering toward our cabin. He walked right up under the balcony and walked around the cabin to the front. I was safely watching the bear from high above…until I realized that our front door was cracked open. We hadn’t been able to close the front door entirely because it was electronic, and closing it would mean we wouldn’t have been able to open it again. My kids and I ran to the front to watch the bear through the door, in case we needed to slam it shut. Instead, the bear wandered past our front steps to try opening the garbage. He then meandered away, only to run into my husband and daughter, who were on a walk. It took them two times up and down the steep mountain to find the coast clear to walk all the way back. Sunday Riding: We raced back toward Chicago on Sunday, making a memorable stop at a horse ranch west of Indianapolis on the way. 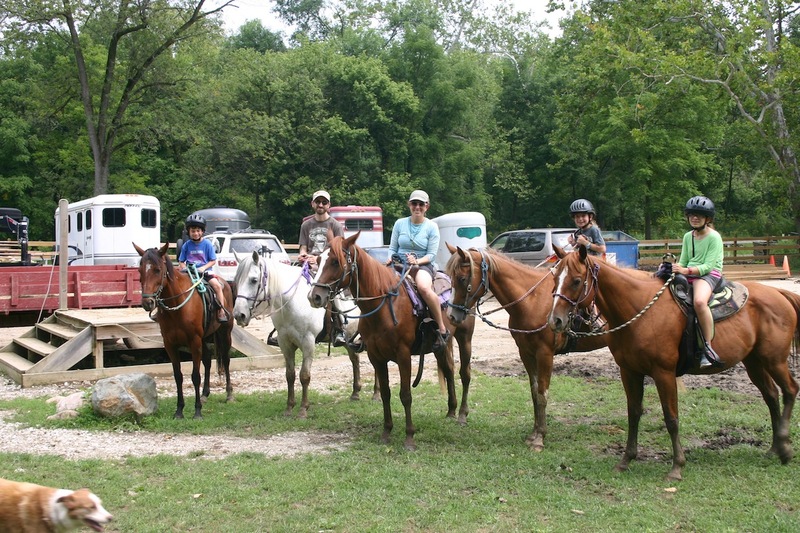 Everyone rode their own horse on a trail for a half hour, with our youngest riding double saddle on back. Sure beats a picnic at a rest stop! “Right Mommy, I never rode a horse before?” asked Granola Boy after he triumphantly finished his ride. We got home Sunday night hungry and tired. 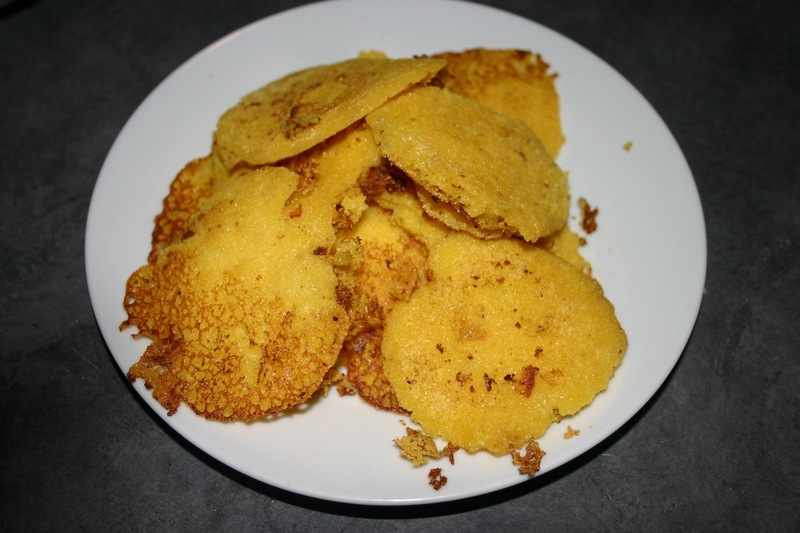 We needed dinner fast, and cornmeal pancakes were the perfect meal for a family missing the South. These are naturally sweet, crunchy and savory. Save the maple syrup for flapjacks and pancakes, though. These are good salty. We ate it with homemade tomato soup because our garden was bursting with tomatoes once we arrived home. Mix all ingredients in a medium bowl and let it sit at least 15 minutes so the cornmeal softens. Heat butter in a skillet on medium heat and then spoon a tablespoon at a time into the skillet. Let brown on one side (a minute or two) and flip for another minute. 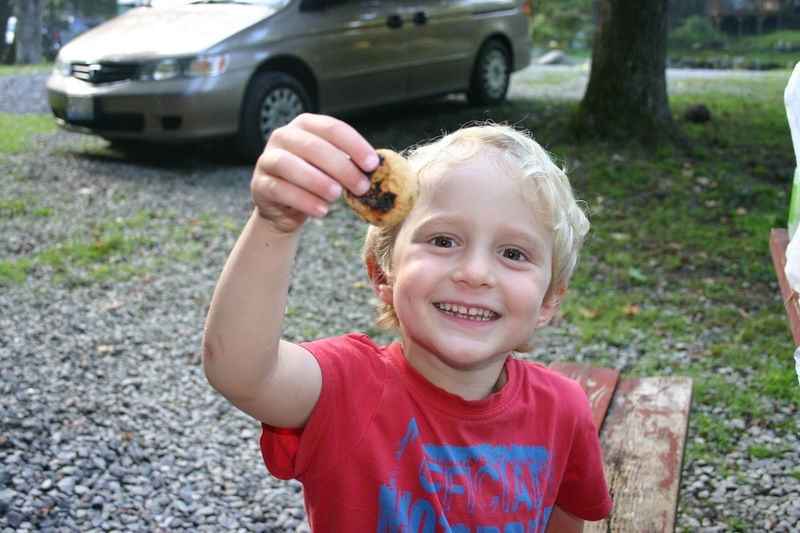 Read this post to find more about what we ate all week camping. 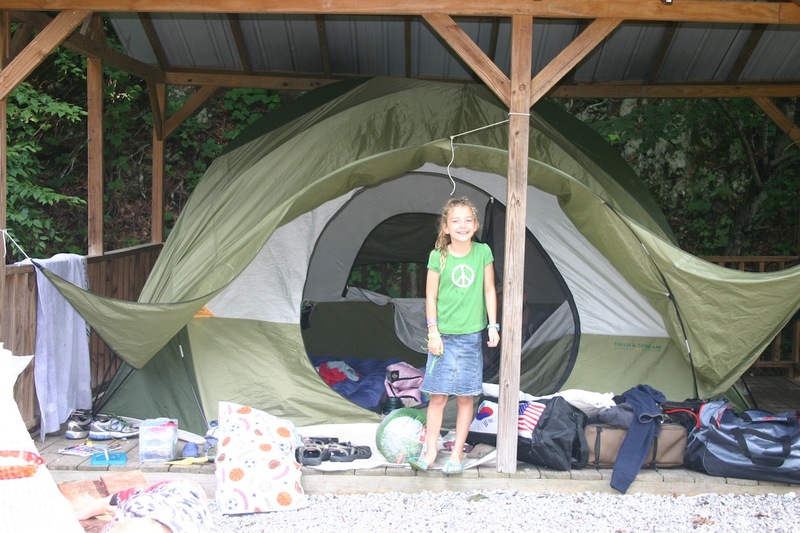 Read this post to find out why we love camping. What a wonderful trip! Bears are too scary! Your Mom read every word!! It was a pleasure!